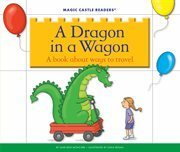 The item A dragon in a wagon : a book about ways to travel, (ebook) represents a specific, individual, material embodiment of a distinct intellectual or artistic creation found in Charlotte Mecklenburg Library. A child goes for a ride with a dragon in a wagon and they continue traveling by a great variety of transportation modes and greet a great variety of creatures along the way. With more than 10 million copies in print, Magic Castle Readers is one of the most successful beginning reading series available today. These books feature charming illustrations and provide children with a fun escape to faraway lands. Curriculum topics are woven into each book and include subjects such as counting, colors, feelings, manners, and many more. Offer your children Magic Castle Readers and watch them enter a world in which they love to read!